Hardy in U.S. Department of Agriculture plant hardiness zones 3 through 8, tulips (Tulipa spp.) are dignified in the garden, standing straight and tall while proudly showing off their distinctive blooms. As cut flowers, however, they tend to twist and turn, as if they want to escape their vases. There's a method to their madness: Tulips continue to grow after being cut, reaching for the light. Keep them lasting longer -- and standing up straighter -- by properly preparing cut tulips for their new home. Choose a container that will support most of the tulips' stems. Tulip stems should be cut at an angle before you place them in water. About a 1/2 inch should be cut from the bottom of each stem. You can trim the stems of tulips already drooping in a vase, for a quick pick-me-up. 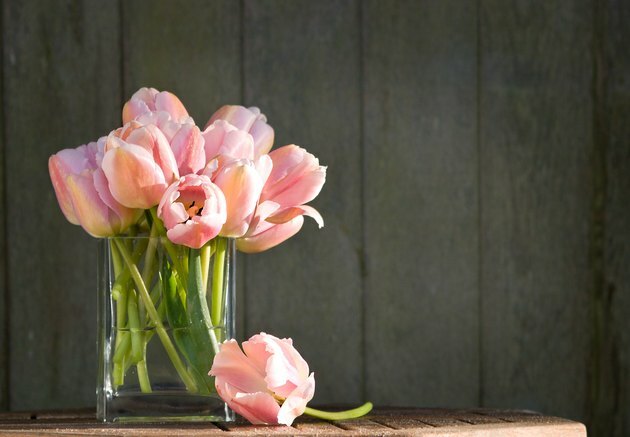 Tulip stems grow another inch or so after you place them in water, according to the University of Vermont Extension, so cutting them after they've grown a bit can perk them up. Because they tend to flip and flop as they bend toward the light source, tulips need support. They'll stand upright in a tall, narrow vase, but can also be placed in floral foam for added support in shorter, wider containers. Rotate the container periodically so each side gets equal access to the light to help tulips stand upright. Fresh water is a must for strong, healthy tulips. Remove any leaves that will be below water level, so they don't foul up the water. Use lukewarm water, which has fewer bubbles to clog up the stems, and top off the water each day. The water should be completely replaced about every three or four days. You can also add a floral preservative to the water to help keep tulips standing up straight and living longer. One way to fix droopy stems is to crowd the container with other flowers and foliage. 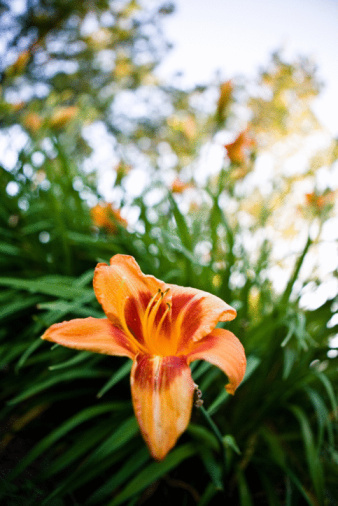 Choose other spring flowers for a cheerful display, and highlight their colors with deep green foliage. The denser the bouquet, the more sturdily your tulips will be held upright. Or, if you prefer the look of an all-tulip display, try making a little slit in the stem under each bloom, about 1/8 inch long. Tulips are temperate plants -- they prefer cooler temperatures. Keep cut tulips well away from direct sunlight or a heat source, as this will cause them to droop sooner. Perk them up by placing them outside at night when temperatures are cooler but not frigid.